HELImetrex uses the highly acclaimed MD4-1000, it has increased flight times, payload and stability and is an important addition to the Microdrone range. 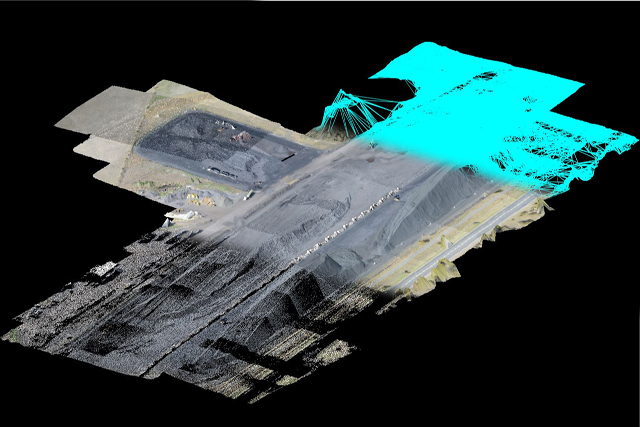 Our UAVs are seen as an ideal tool for mine surveying as we typically operate from the perimeter of busy, working pits, or any survey area, we also have a dedicated RTK system on board. Safety and reliability are paramount with the UAVs that we use. Our qualified photogrammetric staff are able to deal with all types of current spatial information, this combined with 40 years experience in photogrammetry means that we can offer a one-stop-shop for all your current and future requirements for spatial information. At 400 feet, a 2-3 cm GSD is standard for Ortho-mosaic imagery. For DTM’s spatial data accuracy we regularly achieve 20-30 mm XYZ with average control. Higher accuracies can be achieved if required, we have produced DTMs to 5mm accuracy.